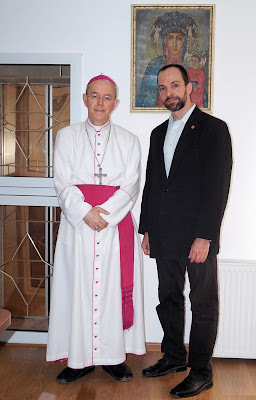 A lengthy and extremely interesting Peter Seewald-style interview with Bishop Athanasius Schneider, conducted in July 2018 by Hungarian theologian Dániel Fülep, is now available for free download as an e-book. The interview delves into Bishop Schneider's relationship with Pope Benedict XVI and the role of the book Dominus Est! ; the St. Gallen “mafia,” the Kazakhstan Catholic Bishops’ statement on Amoris Laetitia, the dubia and formal correction, the message of Our Lady of La Salette and the consecration of Russia to Fatima, the nature of the Second Vatican Council, the essence of Modernism in circulation again today, female ordination, intercommunion, the upcoming Synod on Youth, priestly celibacy, and, of course, liturgical questions such as the loss of Latin, the role of beauty, and the need for eastward celebration. This book, Catholic Church: Where Are Your Heading?, may be downloaded at this link. I highly recommend it and hope that it will enjoy a wide diffusion.